Jaguar has been doing extremely well lately. Last year’s Canadian sales more than doubled compared to 2015 thanks to a redesigned XF mid-size sedan and a big uptake in F-Type sports car sales, but the biggest increase came from two completely new models. Most responsible for Jaguar’s upward trajectory is the fabulous new F-Pace SUV, while the new XE sport sedan is making serious headway too. The XE is the first compact D-segment model offered by the storied British brand since the X-Type that ended its run in 2009. Yes, seven years is a long time without such an important component to a luxury brand’s success, but the car Jaguar showed up with will immediately garner the respect needed to earn its way back to prominence. If the XE isn’t the most attractive D-segment challenger I’m not sure what is. Of course, styling is subjective, but I haven’t met anyone who doesn’t like the new Jag. It smartly pulls design cues from its larger siblings, including the rectangular ovoid grille and cat eye-like headlamps first seen on the XJ and then later inherited by the XF, while its long, horizontal LED taillights are more conservatively penned iterations of both. I must admit my previous XE 35t AWD R-Sport tester looked more enticing than this 20d AWD, which makes sense being that it was a sportier model priced significantly higher, not to mention it came in zesty Italian Racing Red paint over a stunning red on black two-tone interior, but the XE looks handsome in all of its trims, this current Ebony Black coated Prestige trimmed example sporting a standard Jet black cabin with light copper brown stitching in key areas for dramatic effect, plus standard Dark Satin Brushed Aluminum inlays on the instrument panel and doors. It looks more than up to snuff, especially when factoring in all the de rigueur piano black lacquered surfaces, genuine satin-finished aluminum and knurled metal detailing, plus of course the various electronic colour interfaces. A beautiful set of classic circular gauges flank a large, colour, TFT multi-information display ahead of the driver, this loaded up with key go-to features for quick access with as little driver interference as possible, while over on the centre stack is an especially good infotainment system for a near-base model. My previous tester had the best this car has to offer, a widescreen display boasting navigation with 3D mapping, a surround camera and more, while this lesser 8.0-inch system is still larger than some competitors’ top-tier systems, while incorporating a brilliantly clear reverse camera with active guidelines, plus interfaces for the standard dual-zone auto climate control, a superb 11-speaker 380-watt Meridian audio system with HD radio, Bluetooth phone connectivity with audio streaming, and more. That infotainment system (other than its Jaguar InControl Touch navigation and apps) gets pulled up from base Premium trim, which also includes some unusually upscale standard features like power-folding auto-dimming heatable side mirrors with memory, pushbutton ignition, an electromechanical parking brake, a leather-wrapped multi-function steering wheel, rain-sensing wipers, 10-way powered front seats with driver’s side memory, a powered glass sunroof, a HomeLink universal garage door opener, ultra-flexible 40/20/40 split-folding rear seatbacks that expand on an already large and accommodating 450-litre trunk, and more. Prestige trim adds 18-inch alloys, proximity-sensing keyless entry, metal front treadplates with bold “JAGUAR” inscriptions, a softer grain leather steering wheel that’s also heatable, a powered steering column, front seat four-way powered lumbar support, heatable front seats, leather upholstery, the aforementioned navigation and infotainment apps, voice recognition, LED mood lighting, and more. This is how my tester came, a Prestige model with no options priced at $49,500 plus freight and dealer fees, which incidentally is $4,500 more than $45,000 base Premium trim. Both Premium and Prestige trims can be equipped with more, the former allowing a $1,500 upgrade from its entry-level 17-inch alloys to the same 18s found on the Prestige model, while the Premium can be upgraded with the plenty of exterior colours as well as the no-cost choice of Jet black, Latte beige, or Oyster light grey interior colour schemes. It can also be equipped with the same softer leather steering wheel with or without heat, although the heated steering wheel requires the $1,000 Cold Climate pack that also includes heated front seats, a heated windshield and heated wash jets. Addition upgrades include the $2,300 Vision Pack that features HID headlamps with LED “J” blade DRLs as well as auto high beams, adaptive cornering technology, and “powerwash” jets, plus front and rear parking sensors and blindspot monitoring with rear cross-traffic detection. Lastly, base Premium models can be enhanced with some standalone features including the same heatable windshield from the Cold Climate Pack for $400, the Prestige model’s navigation, apps and voice recognition upgrade for $800, satellite radio for $450, and Wi-Fi for $350. All of the same individual features not already standard with Prestige trim can be added for the same price, plus beautiful Gloss Figured Ebony veneer (a dark hardwood) for $400, a head-up display system for $1,000, while the Vision Pack is also available. New option groups include a $2,000 Comfort and Convenience Pack featuring cooled front seats and heatable rear outboard positions, a powered rear sunshade, and a powered trunk lid, whereas a $2,600 Tech Pack adds the larger 10.2-inch InControl Touch Pro display I previously tested in R-Sport trim, with quicker-responding SSD-based navigation, Wi-Fi hotspot connectivity, 17-speaker 825-watt Meridian audio, and connected services such as a route planning app for door-to-door navigation that shares your ETA with specified contacts, a Commute Mode that learns commuting routes and automatically advises of expected ETAs based on live and historical traffic data, an Arrival Mode that displays 360-degree street level imagery of your destination so you can visually find your way, plus more. Additionally, Prestige trims can be upgraded with larger machine-finished 19-inch alloys for $2,000, or optionally a set of $1,000 glossy black 18s that require a $500 upgrade to the Black Design Package which also trims out the grille surround, grille insert, front fender “power vents” and side window surrounds with gloss black instead of chrome. The Prestige can also be fitted with a $1,000 Adaptive Dynamics air suspension that continuously monitors road surfaces as well as driving style via throttle input, acceleration, cornering, and brake pedal analysis and then adjusts a set of electronically controlled dampers to optimize both ride quality and handling. That’s an order box I’d be sure to check, as I thoroughly enjoyed it with my previous tester. Then again the standard car drives brilliantly, its stock fully independent suspension featuring a front double-wishbone design pulled over from the brilliantly balanced F-Type sports car, and a subframe-mounted integral-link rear setup made from hollow forged aluminum for greater strength and lightness. Such engineering advancements come very close to making up for Jaguar skimping on the XE’s interior, because along with the F-Type’s mostly aluminum suspension componentry is a D-segment class-exclusive bonded and riveted aluminum-intensive body structure, 75 percent of which is sourced from recycled materials. Like the suspension it reduces weight while increasing torsional stiffness, which improves performance, quietness, and crash worthiness. Jaguar initially developed this pricey yet much more advanced modular iQ platform architecture for the full-size XJ, one of the better handling cars in its class, but now uses it across its entire range. It immediately makes itself known when taking the first fast-paced turn, the XE delivering a level of precise response to steering input and confidence-inspiring poise that few in this class possess. Its standard AWD helps in this respect, thanks to an ability to shift torque up to 90-percent front or rear or alternatively maintain a 50/50-split on low traction surfaces, plus Intelligent Driveline Dynamics software that instantly adjusts to changing road conditions both predictively and reactively. Speed-proportional power steering that lets you feel the road below helps too, as does braking-derived torque vectoring that aids tire grip all-round, Adaptive Surface Response (ASR) that analyses and then adjusts for different road surfaces, and All Surface Progress Control (ASPC) that’s actually pulled over from JLR’s Land Rover 4x4 division, but in the XE’s case it’s more about overcoming a slippery snow covered driveway or icy mountain road than tackling muddy, sandy terrain or wading through river beds. Another impressive standard XE feature is turbo-diesel power, its 2.0-litre Ingenium four-cylinder producing a strong 180 horsepower and 318 lb-ft of torque for a speedy 7.9-second sprint from standstill to 100km/h and spirited highway passing performance, aided by a quick-shifting eight-speed automatic with manual mode via steering wheel-mounted paddle shifters. The latter is important, as there’s no central shift lever, Jaguar having done away with this space-robbing device and instead installed a rotating gear selector that powers up out of the lower console upon startup. Yup, your friends will be impressed, Sport mode merely needing another twist on the dial from “D” to “S”, while even more performance can be extracted when pressing the left side of a console-mounted rocker switch appropriately adorned with a checkered flag. Alternatively you can select an Eco mode that along with auto idle-stop will help you eke out near class-leading highway mileage of 5.8 L/100km, while it’s still plenty thrifty around town with a 7.8 L/100km city rating; combined city/highway is 6.9. The diesel is relatively quiet, especially when put up against some of its peers’ direct-injection gasoline engines. Importantly, Jaguar has gone to great lengths to make its Ingenium diesel exceed global emissions regulations. First it passed Euro 6 standards, and since then U.S. and Canadian regs, so buyers can feel confident it’s fully compliant with all emissions requirements. 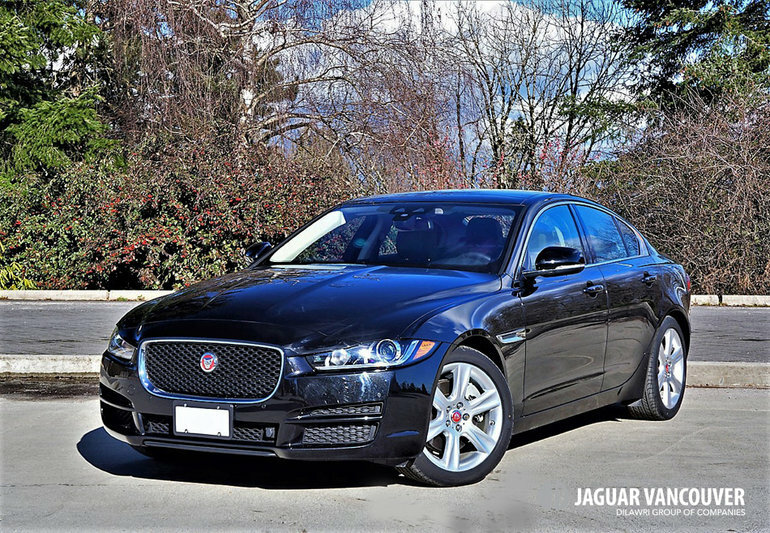 With a fuel-efficient yet powerful turbo-diesel engine in base trim, standard AWD, a full allotment of standard features that aren’t available with most base competitors, plus advanced aluminum body shell and chassis technology, the XE provides excellent value for money. That it comes packaged up in such a beautiful wrapper, boasts a stunning interior, and delivers superb performance makes the XE easy to fall head over heals for.